This is the equivalent of a “lab exercise” to accompany Twitter 103. See that course for the the theory. 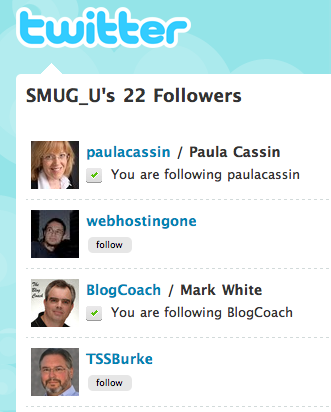 Twitter 104 gives you the step-by-step roadmap to building your own personalized network in Twitter. Please note that you probably want to follow no more than 10 new people at a time on Twitter; because of the spammer phenomenon, following tons of new people at once raises alerts that can cause temporary account suspension (at least I’ve heard that’s the case.) I’ve put a tweet out about this and will try to confirm when I get an answer, and will update the post accordingly. So you may need to complete this course over several days (especially Step Three) to avoid this problem. In a variation on the the old saying, “The family that prays together stays together,” I says “The family that regularly Tweets doesn’t miss a beat.” Click this link and then enter the email addresses of your spouse, offspring, siblings, parents and closest friends. Follow them and ask them to do likewise. Unlike the cell phone providers with their “circles” and “fave fives” you don’t have a limit on the number with whom you can connect through Twitter. In like manner, pick 10 people with whom you work regularly and invite them to join so you can follow each other. Then, as you run across interesting articles on the Web, for instance, you can tweet about them instead of sending the group email that typically snowballs into the “reply all” blizzard that overtakes your inbox. (Not the greatest use of metaphors, but it’s early a.m. as I write this.) If you want to have more company-confidential conversation, Yammer is a Twitter-like service for which I have developed a separate curriculum. If either your family or work colleagues want more information on Twitter and why it’s worthwhile, send them to Twitter 101 for an overview. Just click the “Follow” button next to each name (as illustrated in Twitter 103), and you’ll start to develop a network of like-minded people interested in learning more about social media, and who are tweeting about our discoveries. As of this writing, we have 238 members in our SMUG Facebook group, so I’m hoping our Twitter network will grow rapidly. And because of the velocity of interchanges with Twitter, I’m confident this group of SMUGgles following each other will provide a great platform for connecting and learning together. This ensures that you “see all of the @replies made by people you follow, whether or not you follow the person to whom the reply is directed.” This is a great way to see one side of conversations that you might find interesting, and that you may wish to join. Just as importantly, you’ll see the people with whom your friends are engaged (see the @JasonFalls example from Twitter 103) and you may likewise want to follow them. In reply to my tweet about the number of follows per day that sets off spam alarms, @mflinsch suggested mrtweet.net as a good resource for building your network. So I’ve followed @mrtweet, and will update this post if it becomes Step Five. For the last several years I have kept my personal journal in a series of month-based Microsoft Word documents, with a naming convention of 08January.doc, 08 February.doc, etc. I don’t always do the greatest job of keeping it updated, and of course it’s not searchable. If I want to remember when something happened that I had written about, I have little choice but to open each of the documents and search. And keeping it all in one document was unworkable; I had started with just one file, but found it necessary to later move to the monthly files. 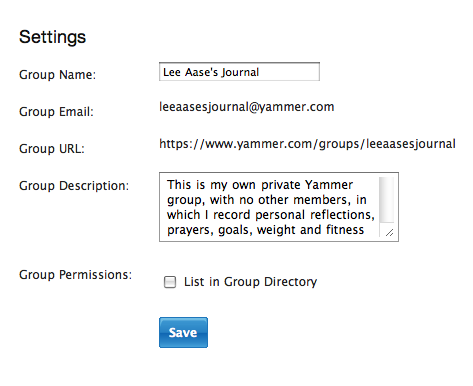 With Yammer’s new Groups feature, I think I have a better solution. 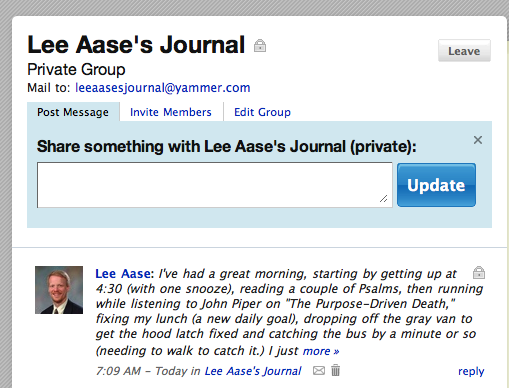 I’ve formed a group called Lee Aase’s Journal that is private and not listed in the company directory, and I’m not inviting anyone else to join (and therefore no one can request to join, either.) No one would know the group even existed if I hadn’t written this blog post. 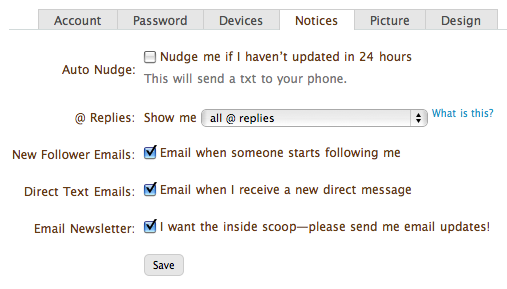 So in essence I have a time-stamped private journal that I can add to quickly and easily. Unlike Twitter, I’m not limited to 140 characters. 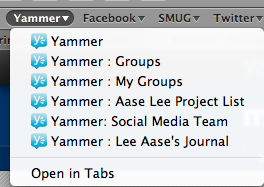 And if I want to find a particular reflection, I can just search Yammer. I’ve done some subsequent posts with my current weight, the time it took to run those two miles, and other tidbits of a more personal nature. I’m pretty transparent, but hey, there are limits to personal disclosure! I’m just starting this “Yammering My Personal Journal” journey, but I think it’s going to be a great way to make journaling part of my daily activity. And not only journaling to get the thoughts out, but to time stamp them and make them easier to retrieve. I’ve set my journal (and other Yammer groups) as one of my bookmarks in Safari, and I believe that will help me keep journaling front-and-center as a daily (if not more) activity. I’ll keep you posted as I develop more experience with Yammering to myself.